One of the paradoxes of reading, especially novel-reading, is that it creates an intimacy that is no intimacy at all. The mythical promise of reading – the unmediated touch of one mind upon another – is enabled by an object that is not the reader’s alone. Secrecy is essential for all kinds of narrative, its premise – that the narrator knows something you don’t, but will tell all – is designed to elicit and then sustain the desire to know. As Peter Brooks has noted, there is something fugitive – he calls it a ‘subterranean logic’ – about the way narratives are structured.1 As he points out, plot signals both the boundedness of a plan as well as a conspiracy of some kind. Plot, for Brooks the organizing logic of narrative, determines what gets revealed when and so is vital for generating narrative suspense. Walter Benjamin, in the ‘Storyteller’, writes that the, and I quote, ‘suspense which permeates the novel is very much like the draft which stimulates the flame in the fireplace and enlivens its play.’2 As this suspense is generated by anticipation and delay, its characterisation as air is appropriate, as is of course the way that it fuels the engine of narrative desire. Narrative takes part in a particularly morbid gothic economy. The reader’s experience of narrative is as if it is in the present; yet the telling always locates the story at some point in the past. When we read, we live a resurrected past out of time, moving from the told towards the time of telling. For both Benjamin and Brooks, the engine of narrative desire consumes the finite lives of characters as it hurtles the reader towards the end. Narrative endings make wholes: with no more to come, the reader can stop, look back and make sense of beginning and middle. ‘The novel is significant, therefore’, writes Benjamin, ‘not because it presents someone else’s fate to us, perhaps didactically, but because this stranger’s fate by virtue of the flame which consumes it yields us the warmth which we never draw from our own fate. What draws the reader to the novel is the hope of warming his shivering life with a death he reads about’ (100). For Brooks, narrative desire is fuelled by, and I quote, ‘the anticipation of retrospection’ (22). Denied the possibility of understanding our own lives as narrative (while we still live we do not know what is to come), we consume the finite lives of others, instead. There may still be things undisclosed at the end, there may still be secrets kept by characters and narrators, but there is no more to tell. This is one reason why the book, as object, is so significant. Endings are important as they demarcate units: a story must end before it can be retold. What the book does is align narrative form with material form: when the narrative ends, so does the book. Part of its appeal, both in the nineteenth century and today, I think, is precisely this alignment of narrative form and print technology. Unlike, say, a short story in a volume, or a serial novel in a periodical, one always knows how much more there is to go in a book. If narrative ‘demarcates, encloses, establishes limits, order’ to quote Brooks, then the book achieves this through its material form (4). While certainly not the only way in which narratives circulated in the period – nor, indeed, the most common – the book was privileged because of its putative wholeness. Binding serves as a material complement to narrative endings, joining the covers around content to produce an object that can circulate or, in a different version of narrative resurrection, be shelved, left, and read again. Both narrative and codex are technologies for structured revelation: secrecy, then, is curiously written through the form of the book. New books were expensive in the period, but books themselves were commonplace. In fact, the high price of new books made them more public: the books that were read were mostly old texts in new (cheap) reprints, or those already been read by others, whether obtained second hand or through a library. Yet the book retained links with concealment. T.P. O’Connor, for instance, writing in 1889 about the new journalism in the New Review, remarked that, and and I quote, the ‘newspaper is not read in the secrecy and silence of the closet as is the book.’3 O’Connor stresses the opposition between public newspaper and private book for rhetorical effect; as Leah Price has recently made clear in How To Do Things With Books in Victorian Britain (2012), the book’s relationship with sociality or asociality is much more complex. Book culture is structured by the interplay between inside and outside, text and object, and that goes for readers too. Nonetheless, there is something about the combination of material and narrative form that fosters the middle-class model of the perfect reader, reading alone, transported out of his or her body, in intimate communion with the mind of the author. Not all books have a linear narrative running through them and many use the form of the codex for other purposes. 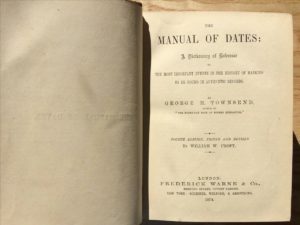 Below, for instance, is Townsend’s Manual of Dates (first edition 1862, this is the fourth). It is, and I quote, ‘a concise and trustworthy compendium of the principal events of Ancient and Modern times.’ There are over eleven thousand entries, arranged alphabetically, with a supplementary index at the back. This is not a book for reading, but for mining; this is not a narrative but a repository. Although a kind of resurrection remains possible, bringing long lost facts back to life, the perfect archive should store but not conceal; it should not, in other words, keep secrets. However, archives are at least doubly marked by intentionality: firstly, the contents of the archive is determined by a process of selection; secondly, in the information architecture itself – the organization of content, the indexing – that structures where items are located and how they’re found. Nobody would read Townsend’s Manual of Dates from cover to cover: the book still has an ending, a final page, but its content goes on. This difference in codex forms is nicely played out in Wilkie Collins’s The Moonstone. When published weekly in All the Year Round over eight months in 1868, The Moonstone had a syncopated rhythm in which narrative breaks between periods, narratives and chapters were also broken by the pauses between parts. The book, published by Tinsley before the serial came to an end, elided the gaps between numbers while bringing the end into view. The novel is an exemplary analysis of narrative secrets: characters keep secrets from each other and the reader; the various narrators all pretend they don’t know what’s going to happen. In weaving its narratives together, Franklin Blake plots the narrative that both clears him of guilt and straightens him out. Although the frame narrative focusing on the moonstone troubles the sense of closure, the book ends with the identity of the thief revealed, the moonstone restored, and the marriage plot fulfilled. Yet when Blake travels to Yorkshire to tell Betteredge, loyal servant of the Verinder family, that Rosanna is pregnant, Betteredge already knows. Betteredge forestalls this final revelation by dipping into Robinson Crusoe. Here, Defoe’s novel is treated like Townsend’s Manual of Dates, an archive of useful fragments rather than a linear narrative. In an novel of secrets, this final one is no secret at all (of course Rosanna is pregnant, the marriage plot demands it); if narrative is about revealing secrets, genre is about setting out the framework within which such difference is managed. Nonetheless, Betteredge has substituted one regime of bookishness, the book as linear narrative, with another, the book as archive or collection. One regime of secrecy supplants another.